Mokaddes Ali Malitha. Photo Source: Daily Amarddesh. By Bangladesh Media; The Daily Star reports, a leader of the outlawed Purbo Banglar Communist Party (PBCP-ML) was killed in a “shootout” between a Rapid Action Battalion team and his cohorts in Alamdanga upazila of Chuadanga early yesterday. 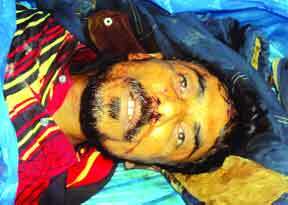 The deceased, Mokaddes Moka, 40, of Bhadua village in the upazila, was the regional commander of the party. Referring to the RAB source Rab-6 Commander Hasanur Rahman Shanto, the Daily Stars Kushtia correspondent wrote "-While patrolling Jamjami village, a team of Rab-6 chased some PBCP members around 2:00am. "RAB 6 Commander says "- The outlaws took refuge at a villager's house from where they opened fire on the elite force members. As the RAB men returned fire, a gunfight ensued. Moka was hit by bullets while his associates managed to flee. The bullet-hit Moka was taken to the local health complex where he was declared dead." It could be mentioned that despite promises many times by the government to the different right groups, -"corssfire", "Shootout", "Encoounter" continues in Bangladesh.